This post by real estate agent Janna Scharf, of Keller Williams Realty Coeur d’Alene, was originally posted on ActiveRain. I just finished up with my fortunate seller client who had the difficult task of deciding which one of three excellent offers to accept for the purchase of her home. That’s right, three outstanding offers. I had a conversation with the agent for each potential buyer and explained the following to them: There will be three competing offers. The seller is doing a Home Affordable Foreclosure Alternatives-approved short sale. There was no point in running the purchase price up above the fair market value that Wells Fargo was willing to accept, which was the listed price. The seller is not going to receive any of the sale proceeds. What would be the deciding factor for her is the strength of the buyer, and their willingness and ability to hang in for the duration. I suggested each of them do whatever they could to strengthen their offer in every possible way. We ended up with three excellent offers, essentially all full price. How to decide? We could have used a dart board, because the fact is they were all great. I pulled out my legal pad and started splitting hairs in a side-by-side comparison. Sometimes I think buyers and their agents don’t realize that there are many different ways to strengthen a purchase offer besides just the obvious one, the purchase price. This is always something to seriously consider when making any offer, whether or not competing with other buyers. What follows are some things a savvy buyer will consider when making a purchase offer in any situation. 10. Present it in person. This seems to be a dying art in my market. Almost never happens. There is just something about making the effort to come hand me the offer in person, make eye contact and explain a bit about the buyer. I always attempt to present offers in person, and at the very least will include a letter to the seller’s agent and seller telling a little bit about my buyer, what they love about the house and pointing out the strengths of our offer. 9. Include any requested addendums and documentation with the offer. In this case, I had requested the offer be submitted along with some addendums I had made available to agents in advance by uploading them into the MLS. Specifically, a short-sale addendum, a Wells Fargo affidavit, as well as the Property Condition Disclosure. One of our potential buyers failed to include any of the requested documents. In a side-by-side, hair-splitting comparison of offers, this was a negative. We didn’t know FOR SURE that they wouldn’t find something on the PCR they would object to, or that they would be willing to wait for third-party approval. Just a couple of little question marks hanging out there that could have easily been eliminated. 8. Include proof of funds to close if a cash offer, or a lender’s preapproval letter. One of our offers was accompanied by a very strong lender preapproval letter. One of the cash offers was accompanied by a very impressive proof of funds to close. When I asked for proof of funds for the third offer, also cash, I was told that the buyer would submit proof of funds necessary to close only after her offer had been accepted. Would you be surprised if I told you this was the same buyer who wasn’t forthcoming with any of the signed documents that were requested? 7. Inclusions. If you are competing with other offers, this is not a good time to ask the seller to include personal property in the sale. Especially if the refrigerator, washer and dryer are specifically excluded in the MLS information. Why risk losing your dream house over an appliance or some kitchen curtains? 6. Inspection contingency. In our case, one of the two deciding factors (remember that we are really splitting hairs here) was that one of the buyers waived their right to an inspection contingency. This eliminated one potential pitfall that could possibly arise down the road, of a buyer canceling their contract based on an inspection. Short sales are sold “as is,” but a buyer always has an opportunity to have a professional inspection, and rescind their contract if they find something unacceptable. This buyer felt that this was a reasonable risk given that the home was fairly new construction and obviously well cared for with no deferred maintenance. Short of eliminating it altogether, a good way to strengthen any offer is to shorten up, as tight as possible, the length time you are requesting in which to perform an inspection. 5. Requests for seller concessions. In our case, this wasn’t any determining factor. But it is always something to consider in any offer. If you are going to request that seller pay for some of your closing costs, vacate the home prior to closing, allow you to take possession prior to closing, take a big hit in the purchase price or otherwise concede something, for heaven’s sake compensate them by strengthening up everything else that you possibly can! 4. Earnest money. In my state it is customary for a buyer to put up earnest money with an offer, to be held in trust until closing. Unlike the state I used to live in, sellers don’t post in the MLS the amount of earnest money they are requiring. Buyers can offer anything. The more skin you are willing to put into the game, the more solid your offer appears to a seller. This is one area that really gets a seller’s attention when you are trying to offset a concession somewhere else in the offer. In an offer on a short sale, an offer will ALWAYS beat out any others when accompanied by a provision that the earnest money is nonrefundable if the buyer withdraws their offer prior to third-party approval. 3. Closing and date of possession. Generally, the sooner you are willing and able to close, the better. If you can be flexible, based on what works best for the seller, you will have a big advantage. This is a detail where conflicts can occur between buyers and sellers. Find out what the seller prefers. A quick closing? An extended closing? Accommodate the seller’s needs if at all possible. Or, if you are asking for a closing time frame that isn’t ideal for the seller, be sure to offset it by strengthening the offer in all other areas that you can. 2. Costs paid by? In any real estate transaction, there are closing costs in a variety of areas. Appraisal, loan origination fee, lender’s title policy, septic inspection, escrow fee, survey, and so on. Although always negotiable, typically the person who benefits from a particular action is the one who pays for it. An appraisal required by a buyer’s lender should be paid for by the buyer, for example. 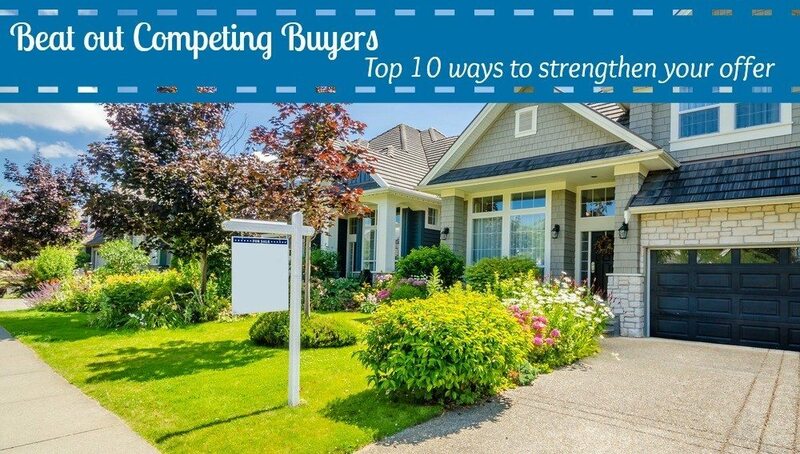 To strengthen your offer, be sure that you are not asking the seller to pay costs that are not obvious seller costs. If you do, realize that this is a concession you are asking of the seller and it weakens your offer. 1. Cash is king. Obviously, this isn’t an option for a lot of buyers, but a buyer will always be in a better position with a cash offer for several reasons. First of all, cash closings are uncomplicated and quick. There is no concern that an appraisal will come in lower than the price in the purchase contract. There are no worries that the buyer’s lender may discover something objectionable, while raking him over the coals, which would disqualify him from obtaining a mortgage to buy the home. First, the offer from the buyer that hadn’t provided proof of funds to close or the requested documents was eliminated. That left us with another cash offer, and an offer from a well-qualified buyer (a personal friend of the seller) who was preapproved to obtain an FHA mortgage. As much as my seller would have loved to see her friend get her beloved home, she opted to accept the cash offer for the reasons stated above. In her case, closing quickly with cash versus waiting for a mortgage to close also meant she would eliminate a ding on her credit score from a missed mortgage payment. Now, for the rest of the story. I knew from my initial conversation with the agent for the winning cash buyer that this first-time homebuyer had saved a down payment, was preapproved and planning to get a mortgage. Imagine my surprise when the offer arrived as a cash deal. He and his parents were on the contract as joint purchasers, and their retirement account would be funding the purchase. This sharp buyer’s agent had acted on my advice to strengthen the offer in every possible way. There is nothing stopping the parents from selling their share of the house to their son after closing, and him getting the mortgage he is preapproved for so they can repay their retirement fund. They went to the trouble of working it into a cash offer simply to strengthen their chances of being chosen, and it worked. This was the buyer who also waived the inspection contingency. Ironically, had they made the same offer but with the buyer still needing to obtain a mortgage, they would have been competing against the other buyer with the same preapproved mortgage status, and they would have lost! Why? There would have been only two things differentiating the offers: that waiver of the inspection contingency from one buyer, and the fact that the other buyer was a personal friend of the seller. In this case, the friendship would have prevailed.